This miniscule yet blissful stretch of Punt Roadian good-ness has given and given for months. While we strive for a stretch reminiscent of a Glenferian or Kardinian kind, those rejoicing in our yellow and black paradise have found that settling into an alien success as simple as sliding into a favourite pair of runners. Yet at times, the shoe is oddly tight, the laces uneven. Seeing a yellow sash atop the ladder was almost jarring in its beauty. Standing at Jolimont station, rain in the air and a whiff of blood after a Brisbane outfit had been brutalized by a vicious Tiger outfit, our old caps and jumpers still on, we saw the old Fitzroy jumpers and empathized, at the least. We see a distinction between sympathy and empathy, sometimes. The win is good. But, we’ve been there. It wasn’t a good place. We were there for a while. But there are a lot of Tigers now – memberships suspiciously new. I hear some bemoan the bandwagon faction growing. But more members can only mean good things. I speak to older Tigers speaking of rattling tins and a different whiff of blood. Those were dangerous times. Richo was our beacon. Bowdo. Browny. We haven’t lost in a while. The Adelaide game in Round 2, yes, but we saw that game in a different light. Our eyes were blinded by yesteryear’s confetti and we lost sight of the goal. The Crows were up. We bludgeoned teams after that. With a viciousness. Older heads nodded, found a similarity with older days. I am newer to this caper. I watched with wild eyes as the geurnseys that brought gritted teeth and winces to my father were stomped by a raging beast in Our Colours. It was something. It was different. The Eagles have a familiarity about them. They bring a force of energy resembling the brimming excitement following the 2017 Tiges around like the scent of garlic. But the connotation, in both cases, differs from the expected. Jack Darling may have our Jack covered at times. Big Nic is our Nank and some more. McGovern definitely shows Rancian traits. And you’ve even got Rioli, Waterman, LeCras in the forward flanks and pockets, flittering around insistently, reminiscent of Georgey, Butters, Sausage Rioli. They might be Eagles but there is a Tigerish look about them. You see it from the bounce. The Gov at centre half-back rules with an iron fist. Yeo holds onto Dusty with a firm grasp. Nank is strong and bobs about yet Naitunui has a leap that defies conventional physics. Andy Gaff sweeps down the wing like an unbroken colt. The first quarter is Eagles footy. But the Tigers do not go missing in this match quite yet. There is that Premiership Brand that arrives suddenly. Jack Riewoldt is flying. The nondescript crew of flankers with names like Kamdyn, Jayden, Kane and Jason swoop. An angry titan with #4 clinging to his backside runs harsh right angles and sweeps the Sherrin forward with a belligerent fury. There is a Jason Castagna snapped major that could be ripped from yesteryear’s highlights. 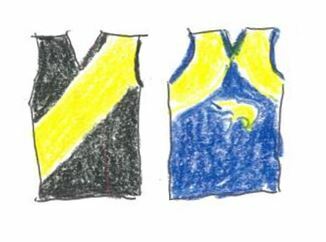 Luke Beveridge in Martin Flanagan’s A Wink From The Universe called it “bebop” and that is Castagna’s goal, Jeep-badged Tigers scurrying about at ground level, carefully nudging the pill to the next saviour, culminating in a Riewoldt snap gathered expertly by the small forward who screws the ball through. It is level at half-time. It is at this point where Jack Darling takes 58 contested marks, 36 inside 50, and not only gives Dave Astbury a bath but drives him to a day-spa, arranges a heavenly chorus to lull him to sleep and then buries Dylan Grimes somewhere in the Swan River. Cotchin goes with Astbury. Castagna, Butler and Grigg organize a search party for Grimes. Perhaps McIntosh has popped the kettle on and begun the new season of The Handmaid’s Tale. Maybe Reece Conca has gone to a yoga class. Anyhow, by any which way, Darling and friends completely atomize the reigning Premiers and go about putting the game to bed. While Riewoldt, Martin and Nankervis show endeavor in their efforts against the seething tide, there is no answer. Jack Redden and Josh Kennedy have their say as well. It’s over but there is a killer instinct in these Eagles. They smell blood and hound the reeling Tigers for every drop. There is a sense about this side. They are not content with but a win. 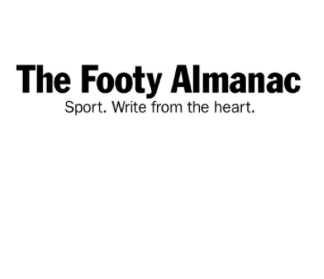 Jack Darling really should have seven – Riewoldt at the other end should have at least six, as the siren blares as he stands with the ball in the goalsquare. Aptly, the talismanic full-forward is left coughing up blood in the game’s breathless aftermath. Richmond head back to the MCG with a few questions. The Eagles awake to a world of dangerous hope. “This miniscule yet blissful stretch of Punt Roadian good-ness” has at its heart imperfection. It’s evident in our team structure and in the occasional shockers we’ve produced amidst the great stuff. I hope this game was just another pothole on this rough but glorious road. Hey Paddy – is this the other loss we had to have? West Coat were incredible I actually really enjoyed watching them – its a shame it was us on the receiving end of such good footy. ” Aptly, the talismanic full-forward is left coughing up blood in the game’s breathless aftermath”. Nothing else needs to be said. Great wrap up. Enjoyed your writing nearly as much as the game Paddy. Love that so many of the Richmond fringe players got to take in some tourist activities while they were here. Very witty Paddy. we’ve been off the pace but winning. see how we rebound. possibly saving the gas for september. possibly out of gas. oh well..
Yeah – that line sums it up. Good stuff. Made the error of watching this with Kasey. Never again!